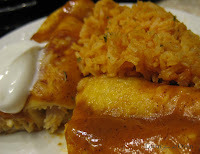 I have tried basically two types of enchiladas: with red sauce and white (cream of chicken) sauce. My family prefers the red sauce, and I have to agree. 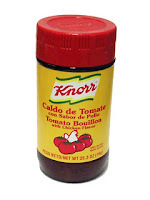 I like to use Knorr's Tomato bouillon for the seasonings and McCormick's chicken base instead of bouillon. The chicken base dissolves more readily than a cube of bouillon and keeps well in the fridge. I find my tomato bouillon at Walmart in the 35 oz size for around $6. There are smaller 3.5 oz sizes for around $3-$4. The yellow product is CHICKEN only...make sure you get the RED jar...it has the tomato flavor and spices in it. For recipes that calls for chicken broth, I like to use McCormick Chicken Base. It is chicken bouillon in a paste form. It tastes fresher than cubed bouillon. I keep it in my fridge. I can find this at Costco. There are a couple of ways to cook your chicken. Boiling, pressure cooking, or microwave. The easiest for me is to microwave. I put the thawed out chicken breasts on a plate and cover it with plastic wrap. I cook the chicken for 3 minutes and then rotate; cook for 3 more minutes. If you are unsure, check your microwave manual. Then I shred them in a bowl by using 2 forks; pulling it apart. It is easier to pull apart one chicken breast at a time. Use the reserved 'juice' from the chicken to keep it moist. When it comes to tortillas for chicken or beef enchiladas, I prefer flour, although corn can be used. I also like to use the smaller flour tortillas; the ones from Costco are HUGE! (I cut those in half) For Cheese enchiladas, I like to use white corn tortillas...they taste milder than the yellow ones. If you want a fast and EASY meal, just warm up the corn tortillas (covered with plastic wrap) in the microwave, put a 'finger' slice of cheese on it, roll it up and cover with enchilada sauce. Microwave it until cheese is melted. So easy, so good! **If you cannot find Caldo de Tomate, use 3-4T. mild chili powder; 1/2 small onion; and 1/8t. cumin. * You can use 1 c. chicken broth + 1 cup water in place of water and chicken base. In a medium sauce pan, put 1 T. of oil. Turn stove to med-high and pour the sauce into the pan. Cook until bubbly and thick, stirring continually, about 5 minutes. Shred chicken by pulling it apart with two forks. Add most of your cheese, stirring quickly if chicken is still hot. Reserve the extra cheese for the topping. 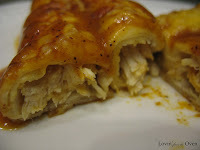 Pour a thin layer of enchilada sauce in your baking pan. Put tortillas, covered with plastic, in microwave for about 1 min. until soft and pliable. Continue rolling to the end of the tortilla. Place tortilla, seam side down, on top of sauce in baking pan. Cover with remaining enchilada sauce. Sprinkle with reserved cheese. Bake in a 350 degree oven for 20-25 minutes until cheese is brown and bubbly. Serve with sour cream, salsa, guacamole and lettuce. This looks great Frieda! Love the flavors.